Words can hardly describe my excitement for this performance. 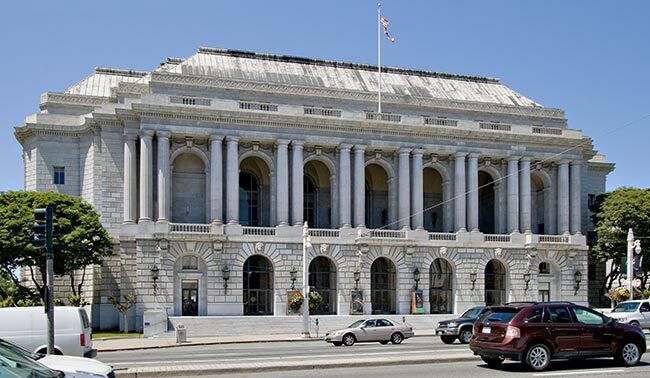 Not only was it a colorful new production of the opera that made me into an opera lover, designed by a famous artist and featuring a starry cast, it was my first visit to the world-renowned San Francisco Opera. For years I’ve wanted to visit that distinguished company and my first experience with it was everything I hoped it would be. Every aspect of the evening was wonderful. 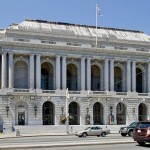 The War Memorial Opera House is a gem of the Beaux-Arts style. Its stately gray exterior, its white marble and gold lobby, the ancient Roman-style columns that grace both exterior and interior, the gold-trimmed glass chandeliers, and the proscenium with its magnificent golden curtain are all quintessential examples of old-fashioned elegance. While I still adore the more modernistic beauty of newer venues like the Met Opera House and my own beloved Dorothy Chandler Pavilion, the Baroque and Neoclassical-esque charms of this house were a gorgeous alternative. It’s a slightly smaller venue than the Dorothy Chandler and felt slightly more cramped, but its beauty compensated completely. Besides, it has two fantastic features that I only wish the Dorothy Chandler had. The first is the dining room where they serve an excellent buffet dinner before the performance. The second is the outstanding gift shop on the second floor, smaller than the Met’s but still with enough CDs, DVDs, books, and other souvenirs to give any opera collector a thrill. 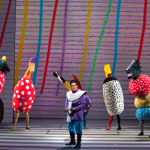 Now, for the performance itself… As shown by a photo collage in the playbill, San Francisco has had a long history of unforgettable Magic Flute productions, designed by the likes of Maurice Chagall, David Hockney and Gerald Scarfe. It seems only natural that for this new production, they once again turned to an acclaimed modern artist, the colorful ceramics specialist Jun Kaneko. 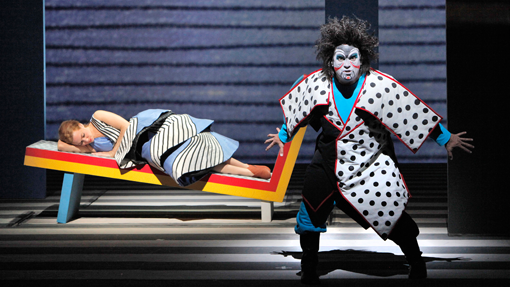 For this opera Kaneko turns away from his usual medium of ceramics, in favor of high-tech video projections. The production is essentially minimalist, the only real scenery being a series of screen-like panels. 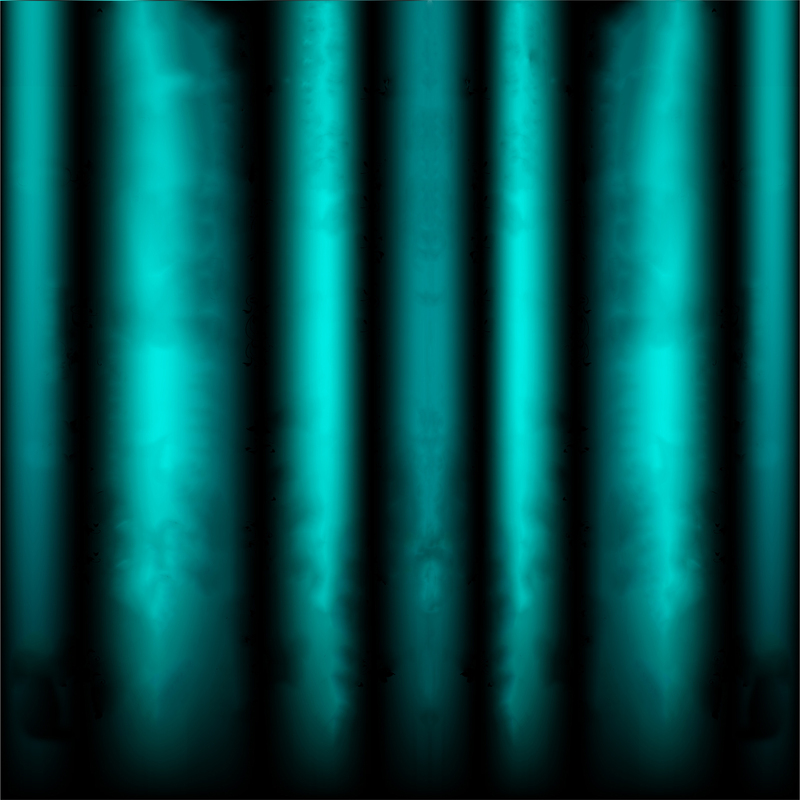 On these panels are projected abstract shapes and lines of all different colors, which constantly move and change, reflecting the different emotions of each moment. Giant, colorful puppets and puppet-costume hybrids are also in evidence, for the dragon at the beginning and for the animals enchanted by the flute. The characters, meanwhile, wear bright, fanciful, vaguely Asian-inspired costumes. 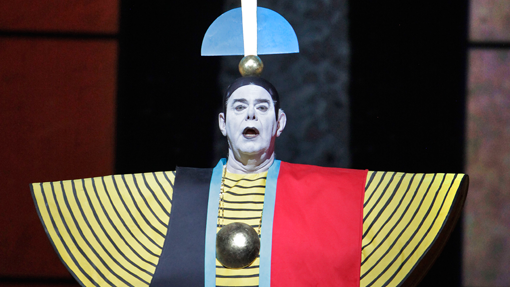 Monostatos isn’t black, but looks like a kabuki villain with a shock of black hair and stark white and red makeup, and Papagena’s disguise isn’t just an old woman, but a strange bird-headed creature. 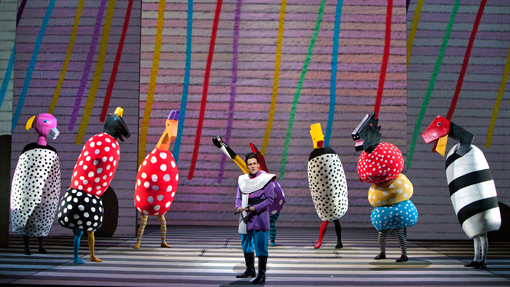 A few visuals recall Julie Taymor’s famous Flute (e.g. Papageno’s green long-johns, the semicircular and pyramidal garb of Sarastro and the priests), but for the most part, this Flute’s look and feel are unique. I’ll admit, I didn’t know at first if I would like the production. I’ve never cared much for abstract modern art and I worried that the constantly shifting shapes and colors would be dizzying and distracting. But soon I was won over. 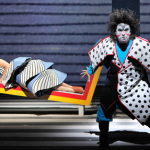 Kaneko’s images are striking, but subtle enough that after the first few minutes I almost forgot about the projections and was fully absorbed in the singers, the music and the unfolding storyline. Instead of dominating, the projections served to enhance the atmosphere of every scene: atmospheres ranging from sunny and silly, to dark and somber, and everything in between, the shapes and colors changing in tandem with the moods of Mozart’s all-encompassing music. The opera is performed in English this season, in a translation by the company’s general director David Gockley. The music is given solid, conventional English words, with large swathes of text borrowed from the classic Ruth and Thomas Martin translation. The spoken dialogue, however, is translated very loosely, with plenty of sly modern references, naughty jokes, and leaning on the forth wall (“Sounds like something out of a drag show!” Tamino quips at the first mention of the “star-flaming Queen”). 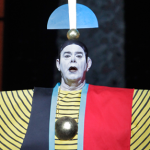 But most of the silliness is fortunately confined to Act I (and to Papageno’s scenes); in Act II the translation becomes more reverent as the action becomes more solemn. One thing that surprised me was that the misogynistic lines from the original text (the one aspect of Flute that’s always troubled me) were generally left in place. But ultimately, thanks to creative staging, they seem to be included only to be subverted as Pamina becomes Tamino’s equal. While he plays the flute during the trial by fire, she plays it during the trial by water, and in the final scene, after the priests hang the Disc of the Sun around Tamino’s neck, he chooses to take it off and instead hang it around the neck of his bride. All of the above is well and good, but it was the performers I saw, both onstage and in the orchestra pit, that truly made this Flute sing. 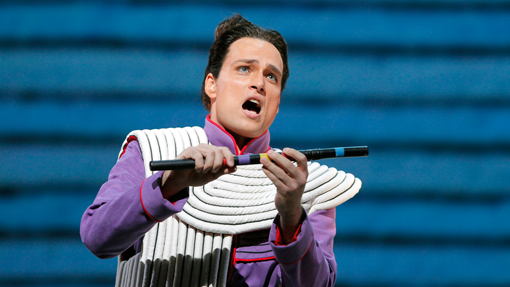 Alek Shrader (whom I confess to having a bit of a crush on ever since I saw him in the documentary The Audition) was an ideal Tamino: young, handsome and likeable, with a bright, clarion voice that seemed tailor-made for Mozart. 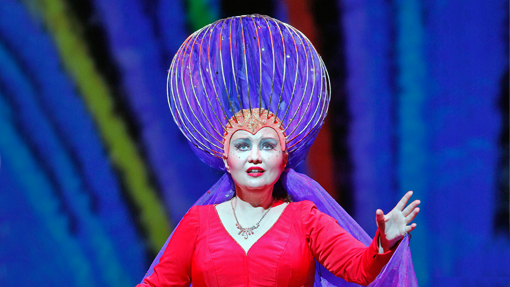 Equally outstanding, if not more so, was Heidi Stober’s Pamina. She sang with impeccable sweetness, warmth and purity, and presented a vivid character arc, transforming from a perky, innocent girl to a courageous young woman matured by suffering and by love. 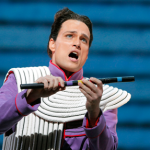 Nathan Gunn, already a familiar Papageno to me, was as endearing as ever with his rich, robust baritone and lively, virile, eternally witty stage presence. 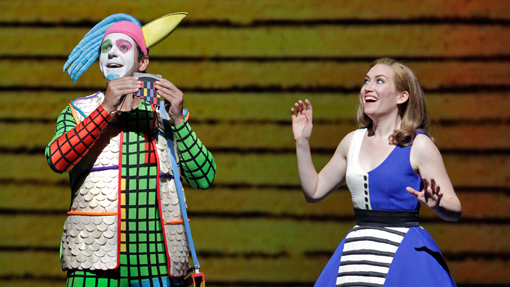 As Papagenos go, he wasn’t the naïve man-child portrayed, say, by Håkan Hagegård in the Bergman film, but closer to the deadpan snarker of P. Craig Russell’s comic book adaptation, a characterization enhanced by the irreverent spoken dialogue. 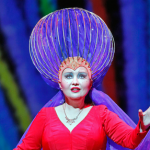 Albina Shagimuratova was a stellar Queen of the Night (no pun intended), with a lush, crystal-clear soprano and sparkling, seemingly effortless coloratura that drove the audience completely wild. Kristinn Sigmundsson, whose Sarastro on Arnold Östman’s 1992 Flute recording has always been a favorite of mine, sang with a less mellifluously smooth bass than he did twenty years ago, but still with warmth, richness and ideal benevolent authority. The always-wonderful Greg Fedderly (my first Tamino at the LA Opera back in 1998) was a memorable Monostatos, funny and threatening in equal measure, while David Pittsinger brought a luxurious voice to the role of the Speaker. The trios of both Ladies and Spirits were flawless and all the other roles were excellently filled as well. Conductor Rory Macdonald led the performance with lively expertise. As if the evening hadn’t been perfect enough already, after the performance came the icing on the cake. Greg Fedderly, whom I had managed to friend on Facebook, invited me come backstage. What a fantastic experience that was! He was as kind and friendly as could be (nothing like Monostatos), and it was a thrill to meet him, as well as to see materials both from the Flute production and from the concurrent staging of Nixon in China. I left the theatre feeling so ecstatic that I probably could have run or danced all the way back to the hotel, high heels and all. This was a truly magical night at the opera. I was there! I was with you throughout this performance and your attention to detail astounds me. I missed a lot of what you wrote except that part that mentions what a blissful, glorious, fabulous experience the whole evening was. It was beyond wonderful. I thank you for taking me.